From wind to waves, European countries are planning a multi-billion dollar grid for renewable energy. (CNN) -- It is a criticism frequently leveled at those promoting wind or solar power as an alternative to fossil fuels: what happens when the wind doesn't blow or the sun doesn't shine? Well, now there is a smart answer, at least in Europe -- we'll simply and instantly switch to another source of clean, green power. Plans for a massive electricity grid dedicated to uniting the varied sources of renewable energy available in northern Europe have taken a step forward in January as nine countries formally agreed to work together on the project. Using thousands of miles of high-tech undersea cables the 'supergrid' will unite wind farms on blustery British coasts with Dutch and Belgian tidal power, the vast hydroelectric potential of Norway fjords and Germany's massive solar arrays. The gird should mean that when one source falls short, another takes up the slack to ensure continuity of supply. 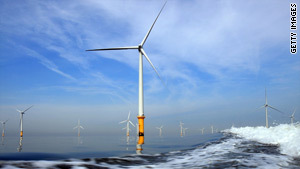 "A North Sea grid will connect offshore wind to our electricity supply, enabling Europe to exploit its largest untapped energy source," Justin Wilkes, policy director, European Wind Energy Association (EWEA), told CNN. "It will connect grids across northern Europe -- bringing more competition into the market and reducing electricity prices. Europe's dependence and spending on imported fossil fuels will be reduced." The countries signed up -- Germany, France, Belgium, the Netherlands, Luxembourg, Denmark, Sweden, Ireland and the UK -- hope to have the grid working within the next decade. It is seen as an essential step towards the European Union's pledge to source 20 percent of its electricity from renewables by 2020. "Without extending and upgrading the grid Europe will not be able to make the emissions reductions it wants, or achieve the level of renewable energy it has set as a target," says Wilkes. There are currently around 100 gigawatts of offshore wind projects being developed in Europe, which could meet 10 percent of the EU's electricity needs. But existing grids aren't capable of fully taking advantage of this potential. "Europe's grids are built around large fossil-fuel plants near large urban areas and nuclear power stations," says Wilkes. "Wind and other renewable sources of energy are often best tapped in other places -- so the grid needs to be extended and upgraded to deliver electricity from where the renewable energy sources are to be found -- where the wind is blowing, where the sun is shining and so on." Advocates of renewable energy believe that moving away from fossil fuels will create thousands of high-quality "green jobs" and provide a boost to the European economy. "A North Sea Grid would be a boost for the wind energy business -- it would enable Europe to build a new multi-billion Euro offshore wind industry -- and provide new markets for on-shore wind too," says Wilkes. "[But] a North Sea Grid would not just be a boost for the wind industry but for all renewable energy sources, including wave and tidal power, and for consumers. It would be good news all round." Of course, none of this will come cheap. The EWEA estimates the cost for building a grid connecting countries across the North Sea region including the Baltic Sea, Irish Sea and English Channel would cost in the region of $40 billion. A report by Greenpeace in 2008 came in lower, putting the price of building a similar grid at $20-30 billion. "Transmission of energy from wind and other marine resources that are a long way offshore is expensive," Tim Russell, grid expert for the Renewable Energy Association, told CNN. "Interconnectors between different power systems separated by long distances and water are also expensive -- but can have considerable advantages in terms of increased trade thereby providing economic benefits. "It is anticipated that increased wind power will increase the benefits of greater interconnection between power systems." Any investment would certainly be a step closer to the idea of a pan-European "supergrid", a scheme that would unite renewable power across the continent with proposed African and Middle Eastern solar farms, and already has political support from UK Prime Minister Gordon Brown and French President Nicolas Sarkozy. "The North Sea region grid would be a very important first part of an eventual European supergrid," says Wilkes. "But such a supergrid would also require better connections across the borders of France, Germany, Sweden, Greece and across southern Europe and the Mediterranean in general." None of this will happen overnight, but EWEA believe it is feasible for 100 percent of Europe's electricity to come from renewable sources by 2050. "There are technological barriers for some renewables, but in wind we have proven technology that delivers competitively," says Wilkes. "Other obstacles for wind are administrative in getting planning permissions and grid access. There is also currently a financial obstacle caused by the lack of credit following the financial crisis, but EWEA is optimistic that this should not be a long-term problem." Whatever the future holds, for the moment green campaigners are delighted. "International support for a supergrid is fantastic -- it will secure plentiful, clean and reliable sources of energy such as offshore wind, and help slash carbon emissions," Friends of the Earth's energy campaigner Nick Rau told CNN. "Now we need the funding and industrial strategy to put words into action."